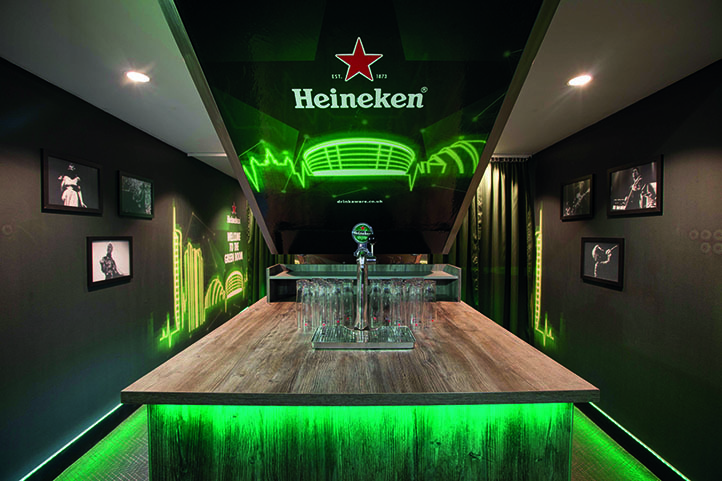 Heineken will use its Green Room for corporate hospitality, as well as trade and consumer marketing campaigns. 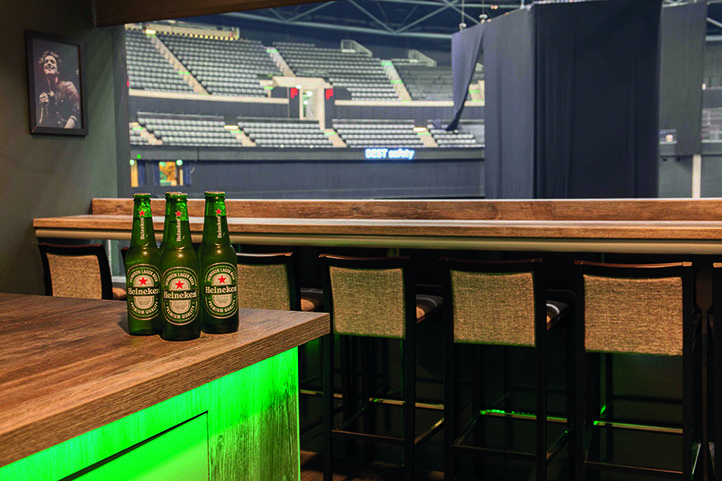 WHEN Heineken UK was signed as the official beer and cider supplier to the SSE Hydro in late 2013, the deal was hailed as a “superb opportunity” for the brewer to showcase its products to the Scottish public. Five years later and Heineken is selling around a million pints of beer and cider through the Glasgow venue’s nine bars every year. With those kind of figures, it’s no surprise the two companies renewed their partnership this year, keeping Heineken in place for a further five years. But it’s not just business as usual. The new agreement will see Heineken expand its range of brands in the Hydro’s public bars, which have until now offered a limited draught range of Foster’s and Strongbow Original in addition to Heineken and Bulmers Red Berry & Lime in the fridge. By the end of the summer these will be joined by Heineken and Strongbow Dark Fruit draught lines at each bar. And the brewer has also introduced a new hospitality suite in the form of the Heineken Green Room. 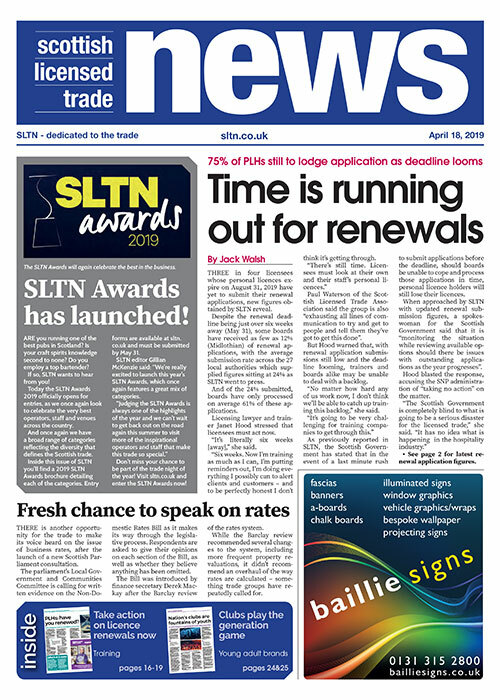 Speaking to SLTN, John Hutchison, regional sales director for Heineken, said the development of the new suite “was a win-win” for both parties. “It was an area the Hydro was looking to develop,” said Hutchison. “And it gave us an opportunity to have a completely branded space where we can do both hospitality and consumer engagement. Having opened in April to coincide with an Arcade Fire gig, the Green Room has so far been put to use entertaining Heineken’s on-trade customers. Hutchison said the company has had “amazing feedback” on the space. “The corporate guests, the publicans, have been blown away,” he said. The area was previously unused space in the Hydro. “It’s eye-level with the stage so in terms of view and in terms of intimacy, it’s phenomenal. As well as providing the company with a new corporate hospitality space the Green Room is also the cornerstone of the brewer’s new trade marketing campaign. The initiative gives licensees the chance to win tickets to shows at the Hydro if they introduce Heineken, Heineken Served Extra Cold or Heineken 0.0 into their outlet on draught and continue to stock it for a minimum of six months. By agreeing to those terms the operators are then entered into a prize draw to win tickets to a show of their choice – which they’ll be able to watch from the Green Room. The suite will also be leveraged on the consumer side, with customers in participating outlets handed a scratch card with their first pint of Heineken. Hutchison said the aim of the promotions is to “add value” for the brewer’s on-trade customers. “Promotions like this shouldn’t just be about doing something that creates a bit of intrigue,” said Hutchison. “It should be about something that drives tangible benefits for the [licensee]. The company hopes that the new Hydro activity will help to build on what Hutchison said has already been a strong start to the year for Heineken. He said the business has installed more than 70 new Heineken Extra Cold customers since the start of the year, with each of those customers given access to the Green Room scratch card kit. “For me, in the on-trade, having really good promotions that add value is essential for brands’ success,” said Hutchison. “For us to be able to tag into the Hydro, which is the third busiest arena in the world at the moment, it’s just phenomenal to have your brands associated with such an iconic venue – not just in Scotland, but globally. The company’s marketing activity doesn’t stop at the Hydro, however. A trade-facing website, ciderdirect.co.uk, which Heineken commissioned through a third party, provides advice and resources for publicans on how to boost cider sales throughout the summer, as well as imagery they can download and use in their social media channels. Personalised printed marketing materials can also be purchased from the site. And later in the year Heineken will be distributing Halloween-themed point of sale materials to the trade for Strongbow. Hutchison said the goal of the activity is to “take the on-trade by storm”.